So let’s talk about what this knife is. It’s a sleek bowie style field knife, that’s as tough as it looks. It offers a seven inch blade, with a full tang ending in a steel pommel, with a handle made of stacked leather washers, giving it an overall length just shy of twelve inches. It’s a full sized knife, without feeling too big. Seven inches is certainly big enough to satisfy any task. Am I right? The blade is made from 1095 Cro-Van Steel. This is simply, as the name suggests, 1095 Steel, with some Chrome and Vanadium added to enhance the corrosion resistance, hardness, and edge retention, while still sharpening easy enough a regular stone will do just fine. It can still corrode if neglected, but the black powder coating does help that. 1095 Cro-Van is a solid blade material without getting into costly alloys that sound better in marketing blurbs and Blade Snobs raise eyebrows over because they are so expensive they require diamonds to sharpen them. No, that’s not what this knife is about. This knife is for letting the air out of Nazi lungs. This knife is for chopping down into Kraut necks. This knife is for opening Jerry Veins. This knife is for spreading Freedom. It’s also really damn good in Camp and Field for more common tasks. Food Prep. Fire Prep. Game Prep. And representing AMERICA. For field use, it’s top notch. The leather handle provides a ton of grip without being abrasive. Even in the wet, it’s properly grippy. And it provides enough buffering when doing work like batoning or using the pommel for smacking things, like tent pegs. 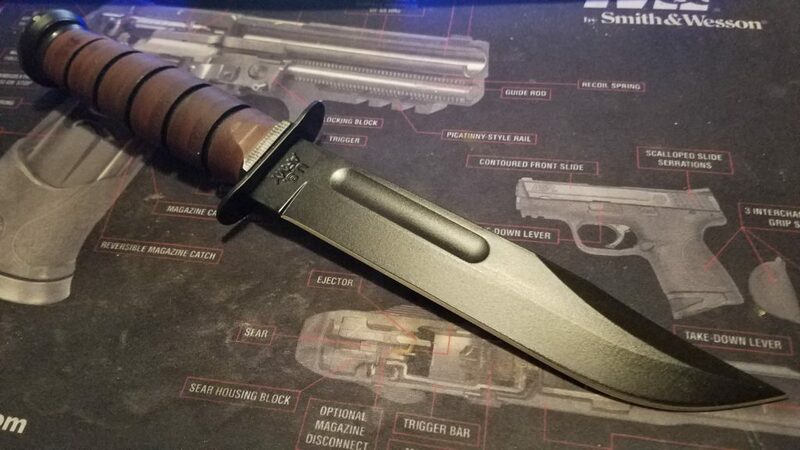 People call knives like this “Fighting Knives” or “Combat Knives”. But to me, a Fighting Knife is a knife that you use getting to and waiting for the fight. Mundane tasks you might encounter in the Field Camp before the battle starts. And if it comes to it, and you’ve run out of ammo… You have enough blade to actually fight with. The Ka-Bar here does that. And it’s knife you can always have with you. It’s not a heavy knife. It’s just over a half a pound. Which means it has a comfortable heft, without feeling heavy at all. And it balances very well in the hand. It can carry all day long in its scabbard without feeling like a weight. Unlike some knives… I’m looking at you, Becker Companion. Okay, that’s not fair… the Companion isn’t less of a field knife and more of a Splitting Maul. But that review is coming later. Overall the knife isn’t just good looking… It is straight up Ruggedly Handsome. 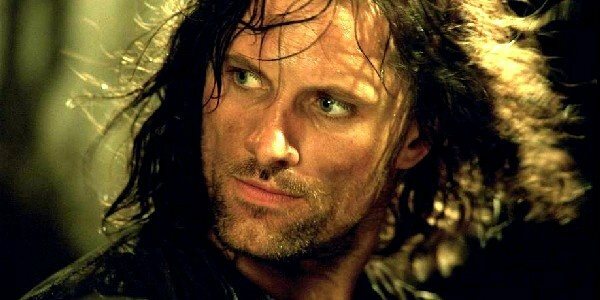 I did a quick Google Search on the term “Ruggedly Handsome” and the definition popped up with the above image of Aragorn from Lord of the Rings. First thought was, “Damn, that’s fitting.” This would be a fine blade for a Ranger from Middle Earth. 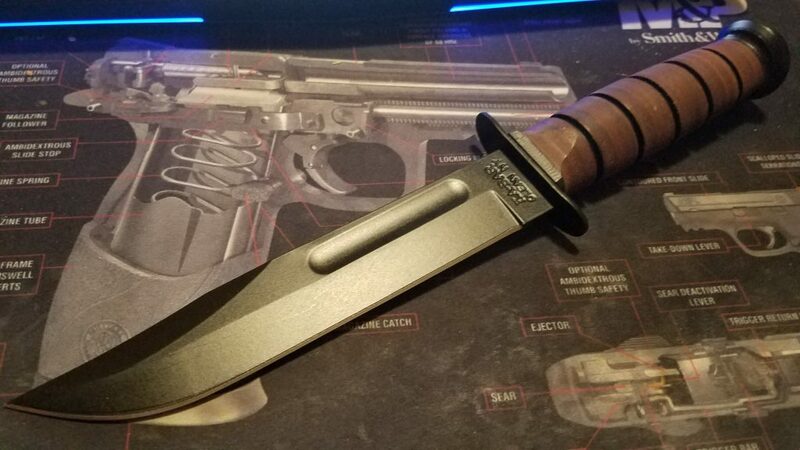 Because it’s also a fine blade for Rangers in the US Army. A knife that can go the distance and get the job done… that’s Ka-Bar. One of the things that really helps out the knife, is the Sheath that comes with it. Normally the Marine and Army knives come with a classy looking Leather sheath, but when I got this, I requested to trade the leather one for the synthetic one you see here. Now, normally, I’d get the Leather one. But mainly when I carry this knife, it’s not on my belt. I carry it strapped to the side of a Pack. And for that purpose, the synthetic unit makes for a better option. One that I can, should I want, switch to belt carry rather easily. I like being about to rig the knife however I want with this sheath, even upside down as it has a retention system and the snap strap around the grip is secondary. This system keeps the knife right where I want it. Overall, this is an incredible jack of all trades blade and sheath system. For under a hundred bucks, I can’t recommend it enough. It’s the one knife to rule them all. I have the deluxe Kar-Bar version that the late Chuck Karwan advocated, with single guard, Kraton handle vice leather stack, pommel pierced for a lanyard, 1.5″ of serrations just forward of the guard, and, most importantly, D2 steel. It came with a black paint finish which I removed. I’m happy with it. Indeed. The traditional KaBar, and all of it’s various models made to the same mil-spec. from various suppliers is the stuff of legends. I’ve loved it since the first time I picked it up and it still goes with me on every foray into the outdoors more involved than taking the dog for a walk around the block. You’re correct about the sheath also. I spent more on a custom sheath than I did on the original knife and haven’t regretted it for a moment. I sharpened the swedge on mine and use it to split kindling or open up things that need it. . . . The Navy Mk 1 is no slouch in the competency department either, in case you haven’t tried it. Own three…did a lot of reading on the knife in the old boo cold steel Convinced me thi is the knife of all knives….